Hikaru Nakamura called today's game a "must-win" and so did Fabiano Caruana, even though he doesn't like that term. Photo: Lennart Ootes/Saint Louis Chess Club. 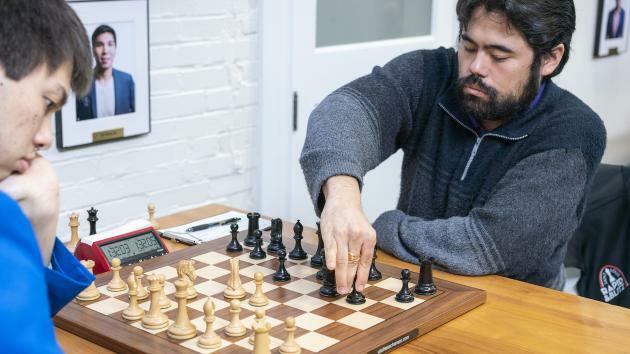 After yet another day of more wins than draws, a full nine players left the Saint Louis Chess Club as winners in round nine of the 2019 U.S. championships. Just like in round seven, the four leading men won again (this time joined by the defending champion) while on the women's side, the title could be decided tomorrow. In fact, although WGM Jennifer Yu and IM Anna Zatonskih have been running away with things all fortnight, it's now official: No other woman is mathematically alive for the title except these two. Yu's draw today gave the veteran a rare opportunity to catch up, and Zatonskih's win halved the deficit to 0.5 points. IM Anna Zatonskih beat last year's runner-up, WIM Annie Wang, to edge closer to the lead. Photo: Lennart Ootes/Saint Louis Chess Club. Zatonskih is now on 7.5/9, Yu on 8.0/9. They'll face each other tomorrow, meaning one of them must get to at least 8.5/10 and thus the third place WGM Tatev Abrahamyan (6.0/9) will have to wait one more year for another chance at her first title. If Yu wins, she would even seal the title with a round in hand. In the open championship, the two leaders will also face off in tomorrow's Super Saturday. GM Hikaru Nakamura will get White against GM Leinier Dominguez. Technically this could end tomorrow also, but that would require one of them to win and for world number-two GM Fabiano Caruana to lose as White to GM Aleks Lenderman, so well, it will likely come down to the Sunday finish. His last two events have had two players, then four players, so Fabiano Caruana might be wondering why all these people are gathered. Photo: Lennart Ootes/Saint Louis Chess Club. At the women's championship, Zatonskih got to within a half-point by first giving last year's sensation WIM Annie Wang more pawn islands, then entering a favorable king-and-pawn ending. "I got an equal position but not dead equal, very playable," Zatonskih said. "It was very precise play." The four-time winner, ebullient after finally being back in the running for another title, caught up with Chess.com after the round. A video interview with Zatonskih. Yu "suffered" a draw, only her second non-win of the event. She's bagged seven wins in nine rounds and still leads, but was under some slight duress after missing the method by which Abrahamyan won the a-pawn. WGM Tatev Abrahamyan drew quite comfortably against the leader as Black, and yet that still ended her title hopes. Photo: Lennart Ootes/Saint Louis Chess Club. Abrahamyan was in her preparation until 12...Qxd1. In fact she knowingly defied her own planning as she had thought pre-round to keep the middlegame going with 12...Qxe5, but went her own way over the board. Abrahamyan said she thought she rushed through the rook ending and perhaps she should have made the time control first before being proactive. "At this point I feel like I should stop prepping because no one plays into your prep anymore," Yu said. "It's kind of annoying!" Whether that was a joke or not, she can expect to be prepping against a grandmaster tomorrow. As Zatonskih explained, her husband GM Daniel Fridman just wrapped the European Championship in Macedonia and can now devote his full attention to helping his wife. Also winning in round nine was WIM Carissa Yip and WGM Sabina Foisor. In the open championship, all the top players scouted out both their own and their rivals' remaining schedule, and planned accordingly. Nakamura gave some insight on his thoughts before round nine: "I didn't realize [Dominguez's] pairings for the last couple of rounds, so I felt that pretty much I had to take a shot in the last few games." He thought he might need at least two wins from three games, and so he trotted out the Chinese Dragon today against GM Ray Robson. "I thought it was the best opening to surprise Ray," Nakamura told Chess.com, explaining that he usually played 1...e5 against him. Nakamura's stepfather, FM Sunil Weeramantry, looks on with club founder Rex Sinquefield. Photo: Lennart Ootes/Saint Louis Chess Club. "The gamble paid off," Nakamura said, "I thought I played almost perfectly." He said his quote referenced not just the quality of his moves, but the tournament standing and timing of the win (which reminded him of a well-timed win over GM Gata Kamsky at the same event in 2015). With both Nakamura and Zatonskih fighting for their fifth career titles, Chess.com asked Nakamura if he had given thought to what number he'd like to end his career with. "Seven would be impressive," Nakamura said. "Especially now at this point considering all the players at the top, it would be great." GM Irina Krush of course has seven women's titles, and there was a time where she started thinking about getting to double digits and setting the all-time ladies' record. "I don't think she's probably going to win another one," Nakamura said. It was a roll-up-your-sleeves and get the job done kind of day for Nakamura. Photo: Lennart Ootes/Saint Louis Chess Club. Since last year's championship, Nakamura has become quite the devoted online streamer. Has that affected his play at all? "Knowing there are a lot of people rooting for me on Twitch, that's inspiring," he said. Leinier Dominguez might be new to the U.S. championship, but he has already played in several events in St. Louis. Photo: Lennart Ootes/Saint Louis Chess Club. Dominguez kept pace by inch-worming his extra pawn up the edge. Much before that he explained that the seemingly-unplayable 12...c5 didn't unnerve him; he was ready for it. "I had to be precise; I was trying to remember the details of my preparation, but still I got some advantage," Dominguez said. The championship newcomer noticed that he's now won a trio of games against the isolated d-pawn. Note to the field: Don't go for the IQP against the new guy! Dominguez may not have the titles of players like Nakamura, but that is for a lack of trying! He's in position to possibly win in his first attempt, which has only happened once in the last 25 years. Caruana also took care of business to keep pace. He's on a tear, having won 3.5/4. Like Nakamura, he needed to dial up something special as Black, and out came the Dutch. After an imbalanced game, he scored the win against the tournament's tail-ender. Chess.com caught up with Caruana after the game and asked whether or not the experience of a world championship match could help him for a "normal" tournament like this one. A video interview with that answer and more. Also winning was GM Wesley So, who was pleased to notch a win after a few draws. What's behind this door? A win! But not any closer to the lead for Wesley So. Photo: Lennart Ootes/Saint Louis Chess Club.